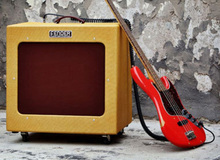 Schertler will introduce at Musikmesse next week its first amps for electric bass and guitar, respectively the Bass Fidelity Series and Charlie. Yesterday I downloaded the free version of a mobile application that makes cats fly! The VT Bass DI offers vintage tone and lots of handy features. How does it compare to Tech 21's other VT Bass products? The new version of the Radial Engineering Bassbone bass preamp has been introduced to our team at the NAMM Show 2014. Peavey's new 1000-watt bass amp head premiered at the NAMM Show 2014. The 400-watt Peavey MiniMax bass amp head sees the light of day at NAMM 2014. Peavey Electronics unveiled this week at NAMM 2014 the MiniMega 1000-watt bass amp head. Bugera announces at NAMM 2014 the introduction of new Veyron bass amps and Turbosound cabinets. The Bruiser Jr amp from the Fuchs Casino Series has made its dayview at the NAMM Show 2014. EBS announced at the NAMM Show 2014 the introduction of the new ValveDrive DI pedal.